Diana Dyer, MS, RD: Winter's Gone! Ah, yes, spring is bursting forth even as our week of unseasonably warm weather goes back to normal temperatures for this time of year (highs in the 40's). 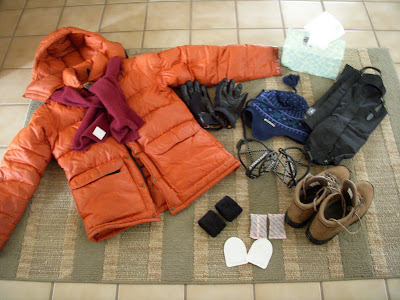 I am sure we'll get more snow (we always do) but here is a pix of my usual winter gear that I can start to think about getting packed away for next year. All these greens were grown in local hoop houses, which are 4 season green houses that use passive solar energy. Our big news this week is that our application to the USDA for a grant to build one at our new farm was APPROVED - WOO HOO! Last thing that was big news this week - arghhhhh..........with only a few minutes of unsupervised time, Kaya found her way into a cupboard that had chocolate chips in it. Sigh.......mucho dollars later, she is resting comfortably back at home, with her pink bandage on the IV site, and unable to connect the dots between the recent hustle/bustle/worry and overnight stay at the animal hospital with her morning sneaky indulgence. It was difficult to determine just how much she ate, so we did wait a few hours to triage, by which time her heart-rate was over 200 and her back legs had no strength at all. Labels: Dogs, Food and Nutrition, Life, The Farm, What's New? It was definitely a lovely day at the market yesterday! We got pasta from pasta e pasta, eggs from John (Our Family Farm), bread from Harvest Kitchen, goodies from Locavorious and blue trumpet mushrooms from Michigan Mushrooms and apples from the Nemeths. YUM! I missed seeing pasta e pasta - I'll be sure to look for them next week. I'm afraid we just won't be taking the time to make our own pasta until after we get moved and well settled at our farm. I'm picturing and looking forward to wonderful leisurely evenings next January and February! I believe those ice-grippy things could be referred to as YakTrax. They give you the footing of a yak! Was Kaya wearing a satellite dish as a collar?